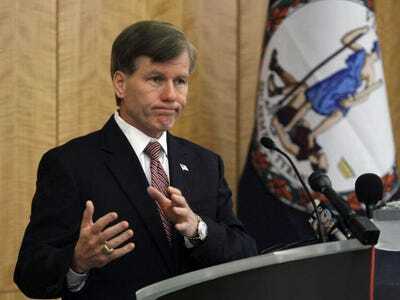 Governor Bob McDonnell is a shining example of why Virginians are fed up with politicians in both parties. McDonnell campaigned in 2009 on a platform of smaller government and low taxes, even telling voters, “I have no plans to raise taxes.” Yet last weekend, Governor McDonnell went back on his pledge in order to ram through a devastating $6.1 billion transportation tax increase on all Virginians. Whereas once Virginia Republicans campaigned on eliminating the car tax, many voted last weekend to increase the titling tax on new car sales by 43% and raise personal property taxes by a whopping 23%. They also raised taxes on every single man, woman, and child in Virginia by increasing the sales tax, with residents in Northern Virginia and Hampton Roads even paying an additional amount on top of the new rate for the rest of the state. McDonnell apparently believes the nearly $350 million combined state and local property taxes Virginia collects each year isn’t enough. Governor McDonnell also claims this bill will reduce gas prices, but the new wholesale tax on gas paid by distributors is guaranteed to be passed on to consumers through rising prices at the pump. All in all, Governor McDonnell’s bill raised state sales taxes, car taxes, regional sales taxes, vehicle and personal property taxes, vending machine taxes, heavy equipment taxes, commercial taxes, hotel taxes, hybrid vehicle taxes, and diesel fuel taxes. For those keeping score at home, that is 10 different tax hikes, courtesy of a Governor who, as previously stated, won office proclaiming he had no plans to raise taxes. This comes at a time when Virginians are already struggling under a still-rocky economy, increased taxes, and stifling regulations coming from Washington. We already saw our paychecks shrink in January with the two per cent payroll tax increase, and higher health care premiums due to ObamaCare are threatening to make health care even more unaffordable. Complicit Republicans coaxed on by “Tax Hike Bob” were so eager to usher in this massive tax increase that they were even willing to sell out to the Democrats and open the door to making Virginia a willing accomplice in ObamaCare by expanding Medicaid. Not only is Medicaid a bad deal for taxpayers – it already consumes a quarter of Virginia’s budget and is growing faster each year – it is a bad deal for enrollees. A study by the University of Virginia found that individuals on Medicaid had worse health care outcomes than even patients who had no insurance at all. Higher costs for worse outcomes? Governor Bob McDonnell said yes, hurting taxpayers and the poor in the process. But Tax Hike Bob wasn’t content to grab more from taxpayers’ wallets through Richmond alone. McDonnell’s deal also depends on increased revenue from Congress raising taxes on all Americans by passing the Internet Sales Tax Mandate and imposing costly regulations on our nation’s job creators. The current proposal in Congress would require Internet companies to collect sales taxes for states in which they have no physical presence. And if that revenue never materialises by the end of 2015, the wholesale gas tax will go up further to cover the difference. Conveniently for tax-raisers, there is no mechanism to reverse this increase if Congress instead passes an Internet Sales Tax Mandate in 2016 or beyond. Virginia taxpayers deserve better. Voters elected Bob McDonnell in 2009 because they were worried about massive spending and taxes and wanted someone they thought would limit government interference in their lives. He has now become the poster child for hypocritical politicians who will say anything to attain power. McDonnell’s campaign rhetoric of not raising taxes has morphed into hardworking Virginians being left to pay the price for his sellout as he exits office. It is abundantly clear Governor McDonnell has ambitions for higher office. He campaigned heavily for Mitt Romney in Iowa and other early primary states last year and was often whispered to be a Vice Presidential contender. But if the Governor thinks voters will conveniently forget about his massive tax hike, he is mistaken. Campaign for Liberty and other groups will be here to remind them. Unfortunately for Tax Hike Bob, what he views as his legacy is only an albatross he will be forced to wear around his neck in shame.